ChurchSuite retains a history of event signups against all your contacts. It is also possible to add your sign-ups to a Tag or Tags. ChurchSuite makes it really easy to do that direct from your "Calendar" > "Events" page. Simply select your event and scroll down to the sign-up section. From the "Add" drop-down menu, select "Add to tag". Note: Tags are recorded for both Address Book and Children contacts respectively. Sign-ups not in your Address Book or Children module are obviously not recorded with a Tag - add them to the Address Book or Children module first, and then run the "Add to tag" routine. Since contacts and children can only be added to a Tag once, you can safely run "Add to Tag" for a list of sign-ups and only untagged sign-ups will be tagged. Those already in the tag will be ignored. As you type a Tag name, ChurchSuite will auto-suggest from your existing Tags, or you can enter a new Tag name and press 'enter' within the Tags box to create the new Tag. 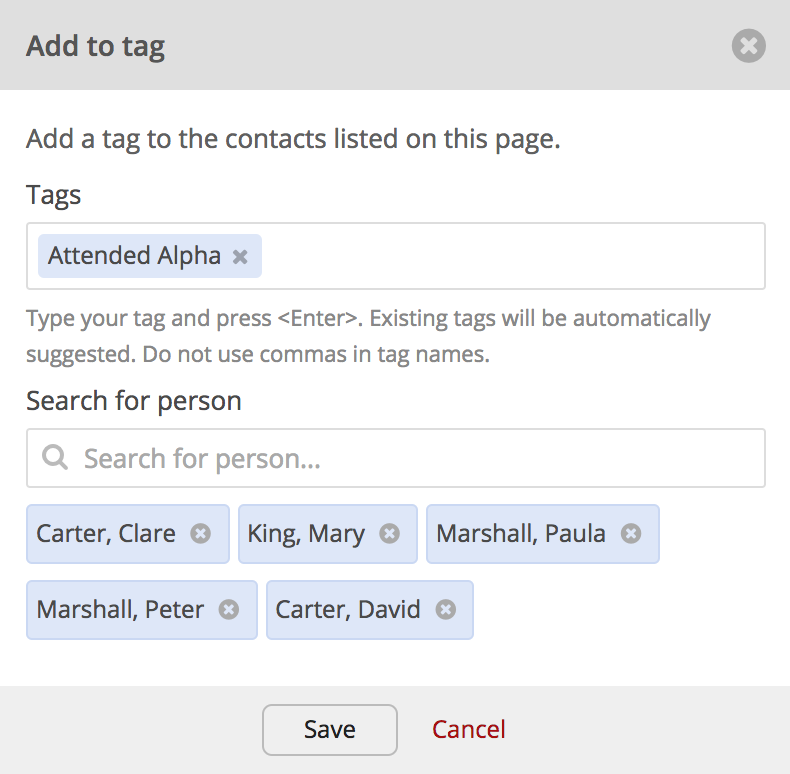 ChurchSuite populates the list of contacts to be assigned with the Tag. At this point you can manually search and add, or remove, names if you wish. Your newly added Tags now show in each contact's profile in the Tag section (see Youth Training in the example below). You can manage and report on Tags further in "Address Book" > "Reports" > "Tags" and "Address Book" > "Tags" (Also in the Children module).